Our treatment strategy takes into account each patient’s individual symptoms. We focus on offering the gentlest solutions for healing our patients after thoroughly evaluating all opportunities and risks. For the benefit of our patients, our treatments are guided by the principles of care, appropriateness, and as little stress for your system as possible. Based on our vast experience and routine in the field of vascular surgery (approximately 34,000 surgeries since 1994), we can offer the highest level of medical comfort to our patients. We offer both inpatient and outpatient treatment of venous disorders. Smaller, minimally invasive surgeries are performed directly in our clinic. We also offer a gentle method called Venefit™. These short, small, but very effective treatments allow the patient to walk out ready to immediately resume their normal activities with virtually no downtime and minimal discomfort. Treating artery diseases often involves a short inpatient stay (e.g. for inserting balloon catheters, stents), mostly no longer than one day. The gentle procedures allow for a quick recovery, and patients can quickly resume their day-to-day activities. 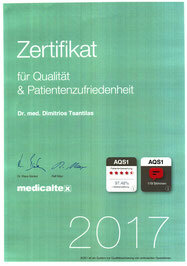 In our outpatient practice in Augsburg, we insert medical implants using local anesthesia. We are specialized in implanting cardiac pace makers and inserting port catheters for tumor therapy. Generally, we treat lymph vessels conservatively using manual procedures. Surgeries are an exception. Manual lymphatic drainage and compression stockings (bandages for arms and legs) have proven to heal most symptoms. For compression stockings to support a damaged lymph vessel from the outside, it is crucial that the stockings fit exactly to the patient’s arm or leg. Therefore, we tailor it exactly to the patient’s limbs.